Text by John Phillips R.I.B.A. 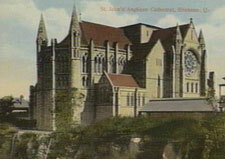 In literature dealing with nineteenth century architecture, Pearson is generally loosely grouped with a number of other architects and described as one of those who developed the Gothic style during the Revival, with mention being made of Truro Cathedral and one or two of his larger churches. Few, therefore, know how prolific he was in his architectural creations and with what genius he designed a score of beautiful and dignified churches of cathedral like dimensions with noble proportions, vaulted roofs and interiors full of variety, constructed for a reasonable cost and in a durable fashion. Truro Cathedral was, in fact, this great ecclesiastical architect’s “magnum opus” but it was in his larger parish churches he developed his own individual style with such success. He alone of the revivalists used the vault with ease and with it produced a quality of soaring aspiration which is so sadly lacking in many nineteenth-century churches. The general development of Pearson’s work is inextricably bound up with the growth of the Gothic Revival during his lifetime, from 1817 – 1897, he passed through the major stages of the Revival and became one of its leaders. This leadership, however, was confined to works and not to words and he was content to rest his reputation on the merits of his executed works. started his early works which were mainly in Yorkshire. Even in these examples there was always a sign of originality at a time when any mistake or diversion from the recognised style was considered an architectural sin or mark of ignorance. These churches, which were built of local stone and are in keeping with their surroundings, whilst not particularly attractive, are infinitely more pleasing than most of the work of his contemporaries. The masterpiece of this early period is Holy Trinity, Bessborough Gardens, London, a production equal to the best of the imitative works of the Revival and praised by many critics at the time it was erected. It is to be regretted that this fine building should have been demolished under the London Diocesan Reorganisation Scheme. towns and cities with disastrous effect. Nine out of ten churches built during this period are dwarfed and overpowered by the surrounding buildings and lose scale by the multiplicity of the small units in their assemblage. Pearson’s later works, from 1870 onwards, are of greater value and interest due to their more individual style and original nature, but this individuality and originality were displayed to the full without descending to eccentricity or venturing far beyond the bounds of precedent. Modern writers, commenting on the similarity of Pearson’s several churches in his later period, have stated that when one church has been well examined and appreciated, the remainder, despite their variety, are almost immediately recognisable. Whilst acknowledging a marked likeness between many designs, they are all different expressions of Pearson’s one conception of what a church should be. In the intensely personal work of one man, it is only natural certain successful and well tried ideas should recur and each design in its expression of the one personality must bear some resemblance to the others. It has been said that a great architect builds with an innate cunning of proportion which embrace all beauty and a divine ingenuity of skill which improvises all construction. Pearson’s remarkable sense of proportion and composition is displayed in his later churches which, although of modest dimensions on plan and not unduly lofty, create the impression of a small cathedral by the skilful adjustment and proportion of the several parts of the building. Whilst he built along traditional lines with load bearing walls and piers, Pearson reduced these to the minimum, consistent with sound construction, to resist the thrust and counter – thrust of the complex forces present in a Gothic structure. The chief splendour of Pearson’s churches lies in their grand interiors though externally they are well articulated with a good disposition of simple masses. The first impression on entering one of Pearson’s churches is of a cathedral-like edifice covered with a stone vault from one end to the other. Here he seems to have emulated the mediaeval master masons of northern France who strove to achieve great height in their naves, yet tempered with some of the width and spaciousness on plan usually attributed to the southern European countries. The nave and chancel are usually bounded by one aisle on each side, sometimes two, and the range of arcades, pillars and vaults including those to the transepts and chapels also give an impression of great size, besides numerous attractive vistas. The apparent great height internally is achieved by increasing the height of the clerestory, which leads to the clerestory windows forming the predominant lighting. This flood of light gradually becomes diffused among the many pillars and arches of the aisles and is broken up into a rich gloom producing a mysterious and jewel-like illumination. stone inside and out: St. John, Upper Norwood, a slightly larger and broader edition of St. Stephen’s but with a square east end pierced by a double tier of five lancet windows: All Saints’, Hove, one of the largest parish churches in England, a fine edifice but not in Pearson’s usual style: and St. Stephen (dealt with elsewhere). The following extract from Sharp’s “Cistercian Architecture” published in 1874, of which, incidentally, Pearson possessed a copy, could form an apt epitaph for Pearson’s works: For vigour and boldness of design, for excellence of proportion and for simplicity, elegance and purity of treatment they are unsurpassed by buildings of any age or country. A careful study of their numerous excellencies could not fail to exercise a beneficial effect on modern designs, by checking the exuberance of ornamentation and by the cultivation of purer taste, delighting rather in form and outline than in colour and surface decoration. 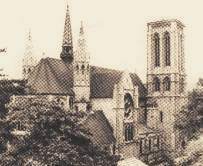 As a postscript to my articles on J.L.Pearson and St. Stephen (written some twenty years ago) I refer to its relationship with Brisbane Cathedral. 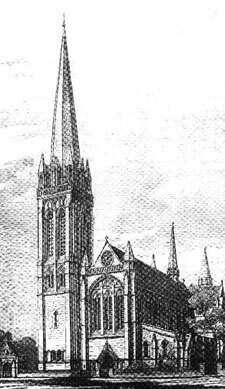 Although the initial design for this cathedral was prepared by Pearson in 1886, subsequent modifications were made by his son in an attempt to satisfy the wishes of the Bishop who was looking for economies. St. John’s, Red Lion Square in London was designed by Pearson and built in the 1870′s. The Vicar at the time was William Webber. He was consecrated Bishop of Brisbane in 1885 and he commissioned Pearson to design a cathedral commenting that he had already created one masterpiece in London for him and was looking forward to another in Australia. 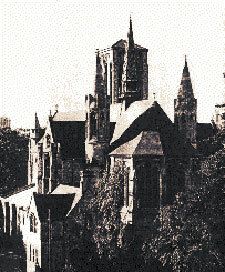 Eventually the cathedral was started early this century and the eastern portion up to the first bay of the nave was completed in 1910. Two further bays of the nave were added in the 1960′s and an appeal for the completion of the building was launched in 1988. I was appointed design consultant at that time as there were no detailed drawings prepared originally. As with the early days in Queensland funding has been slow. Masons have been trained by a mason from Exeter who is the Contracts Manager on the site but some have had to be laid off for lack of money. It is hoped that the west end of the cathedral would have been finished by 2001, the centenary of laying the foundation stone but this seems unlikely unless the financial resources improve soon. much simpler in its details. The apsidal east end is reminiscent of St. Stephen but rises to a height of 80ft. without the intermediate subsidiary arches. It would appear that St. Stephen was the model for Brisbane although a number of Pearson’s later designs for the larger churches had many similarities these were without the refinements visible in St. Stephen. This makes St. Stephen arguably the finest of Pearson’s major churches. In comparing Brisbane and Truro the latter is slightly larger but the style seems to be related to the dedication. Using human terms St. Mary at Truro is more delicate and refined as befits Our Lady compared with the more masculine and bolder detailed St. John of Brisbane. John Phillips, R.I.B.A., was appointed architect to St. Stephen’s over 40 years ago in 1953 and at that time wrote three articles for the Parish Magazine (two of which are reprinted above). 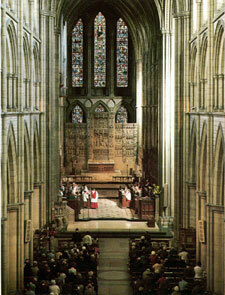 In 1960 he was appointed as Surveyor of the Fabric of Truro Cathedral and is still retained there as a consultant. Eight years ago he was asked by the Dean and Chapter of Brisbane Cathedral to act as design consultant for the completion of Pearson’s Cathedral there. At present he is preparing a leaflet about Pearson for Truro Cathedral.